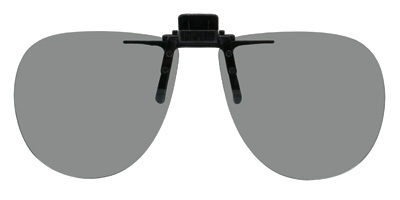 Flip Up - Our "patented, all metal" flip up mechanism securely clips to the top of your plastic or metal frame, allowing you to obtain polarized, 100% UV protection with our superior polarizing lens system, protecting your eyes from the sun's damaging rays and blinding glare. 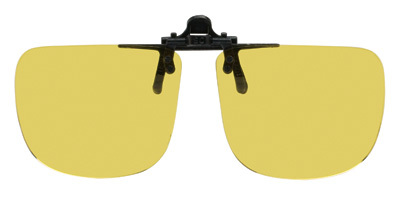 In addition, our polarized lenses are also highly scratch resistant. You now have the convenience of just flipping them up or down while boating, fishing, or just driving your car. Our patented flip up "all metal" mechanisms are virtually unbreakable, and the metal mechanism from our proprietary "sticky" vinyl clip coating system protects your lenses by preventing slippage and scratching. Our patented all metal G Flip Ups, teamed up with our shatter proof, lightweight polycarbonate lenses, providing the avid sportsman and outdoorsman, needing visual clarity while wearing your prescription eyewear. Our flip up design provides you with superior sport sunglass protection, providing 100% Ultra Violet protection while Golfing, shooting or just driving in your car. 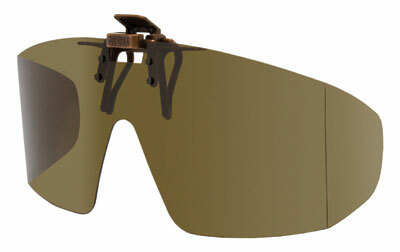 Our patented all metal D Flip Ups, teamed up with our shatter proof, lightweight polycarbonate lenses, providing the avid sportsman and outdoorsman, needing visual clarity while wearing your prescription eyewear. Our flip up design provides you with superior sport sunglass protection, providing 100% Ultra Violet protection while Golfing, shooting or just driving in your car. Safety Shield - Our glasses are made with high-quality frames and UV 530 lenses for ultra-violet protection for dental and medical professionals. Flip Up Magnifying Readers - Magnifying, crystal clear full eye or top eye lenses teamed up with our "patented, all metal" flip up clip. This design is tailored to turn any pair of prescription eyeglasses or sunglasses into a hands free magnifier or reader. Just flip them down when performing precision detailed work, hobbies, such as stamp and coin viewing, modeling, at work sitting in front of your computer or just reading a book. These lenses enhance the finest details with pure clarity and ease allowing your eyes to remain relaxed and focused on the task at hand. Our "patented, all metal" flip up mechanism securely clips to the top of your plastic or metal frame. 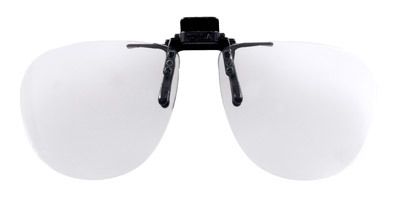 The proprietary "sticky" vinyl clip coating system protects your lenses by preventing slippage and scratching. Powers are available in + 1.00 through +3.50 in quarter power increments. G Wrap® Flip Ups - "larger frame styles with peripheral protection" Our "patented, all metal" flip up mechanism securely clips to the top of your plastic or metal frame, allowing you to obtain polarized, 100% UV protection with our superior polarizing lens system, protecting your eyes from the sun's damaging rays and blinding glare. 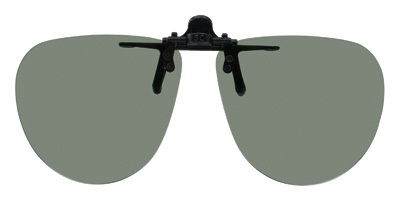 In addition, our polarized lenses are also highly scratch resistant. The G Wrap Flip Up not only provides 100% UV protection but this amazing wrap around design protects your eyes from all angles, giving you a full protection from the sun's damaging rays. You now have the convenience of just flipping them up or down while boating, fishing, or just driving your car. Our patented flip up "all metal" mechanisms are virtually unbreakable, and the metal mechanism from our proprietary "sticky" vinyl clip coating system protects your lenses by preventing slippage and scratching. Italian Flip Ups - These high quality Italian handmade plastic frames can flip up while wearing them. 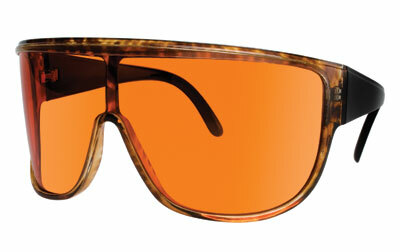 Available in 4 frame colors with polarized lenses and UV400 protection to protect against harmful sun rays.